The Seychelles Parrot (Coracopsis barklyi) is threatened by introduced predators and persecution by people. Outcomes: Scientists working with the Ministry of the Environment have participated in studies for the Seychelles Parrot, however, new research was necessary since up-to date information was lacking. This, and island development which has disrupted the environment has left real concern for the survival of this species. In 2008 The World Parrot Trust supported Ellen Walford’s thesis field research into the ecology of the Seychelles Parrot. In addition to informal interviews with fruit farmers, biologists spoke to schools and community groups about the island ecology and the birds. Environmental education and awareness are highly valued in the Seychelles. Where found: Praslin Island, Seychelles. History: The Seychelles Parrot (Coracopsis barklyi) is endangered in the wild; less than 750 individuals remain. The species is at threat from competition for nest sites from Myna Birds. Introduced rats have also been shown to be a major threat to natural nest sites. 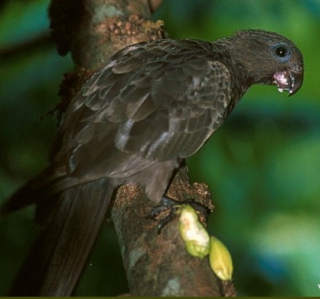 Ecology: The Seychelles Black Parrot is seen in a variety of habitats including forest, savanna, wood surrounded villages, primary forest and cultivated areas. This parrot eats seeds, berries, fruits, nuts, insect galls and cultivated crops in small noisy flocks. Uniquely, they also are active on moonlit nights. On Seychelles, birds are generally seen only in singles or pairs. This parrot is endemic to only two of the 155 islands in the Seychelles archipelago in the Indian Ocean.